Stay Fit And Healthy - Enjoy Nutritious Homemade Meals Everywhere With The #1 Food Storage Containers By Freshware! These reusable lunch containers with lids for meal prepping are made from 100% BPA, PVC, and Phthalate free food-safe material. Stackable, airtight and leak-proof when closed - these deli containers won’t let your food spill all over the pace. Our clear lids and 16 oz containers make it easy to see what’s inside so you know exactly what you’re grabbing for in the fridge or lunch box, making life so much simpler. Microwave, dishwasher, and freezer safe! - Clean them hassle free in the dishwasher top rack. Box Size: 4.6 inch top diameter x 3.4 inch base diameter x 3 inch height. Volume: 16 ounce/1 pint. Pack of 36. SAVE TIME AND MONEY: Most plastic containers don't last for a long time. They crack after a few uses and melt in the microwave. Not Freshware, our heavy duty lunch containers are built to be more strong and reusable than our competitors. HEALTHY MEAL EVERYWHERE: Featuring deli containers with portion control help you keep your 21 day fix meal plan and lose weight. 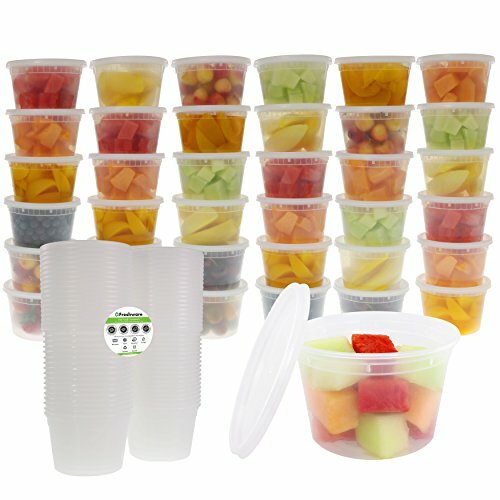 These food storage containers can also be used as school lunch box, last night's dinner, or slime containers for the kids! MICROWAVE, DISHWASHER AND FREEZER SAFE: Made of the highest quality food safe materials, these bento box can withstand temperatures from -40C to +120C (-40F to 250F) - so enjoy without worry about harmful chemicals or plastic leaking into your food.